Svartsot began in early 2005 after the band’s precursor, a folk/black metal band in Randers called ‘Skoll’, came up with an idea for a song called Svartsot (meaning black sickness). As Frederiksen had also begun writing melodies which were leaning away from the black metal-formula, the genre changed to folk metal, and Svartsot was born. It was decided at this point that all lyrics would be in Danish, and that they would be about the history and folk-lore of Denmark. A selection of new songs were compiled in this vein whilst some older Skoll songs, including the legendary Jotunheimsfærden, were updated to the new style and two demo CD’s were produced: Svundne Tider in late 2005 and Tvende Ravne in 2006. The latter attracted the attention of Napalm Records, who signed the band early in 2007. In July 2007 the band entered the studio of Jacob Hansen to record the first album, “Ravnenes Saga” (The Saga of the Ravens). The album was well received and through 2008 the band set about touring with the likes of Tyr and Alestorm to promote the album. As material was being compiled for the second album, cracks began to appear within the band and following, amongst other things, an argument over whether one particular song should appear on the next release, all the band members, excepting Frederiksen, decided to leave. However, they had not counted on his resolve to continue, and he duly recruited new members in the big-line-up-change-of-2009 saga. This ‘new’ Svartsot was rehearsed and ready to go without having to cancel a single show. However, as Frederiksen had been the main songwriter and lyricist, none of the essence of the music was lost. The band re-entered the studio in 2009, this time the studio of Lasse Lammert’s in Lübeck (Germany), and “Mulmets Viser” (Songs of the Darkness) was created. The music evolved into a more complex beast, with more instruments, harmonies and tasty melodies than ever before. Frederiksen and Atkin then began writing material for album no. 3, a darker and more medieval inspired work on the outbreak of the Black Death in 1349. The song-writing evolved further in the direction of the later songs written for Mulmets, becoming again more complex, with more instruments, more lead and harmony parts, and much to Bager’s dismay, even more lyrics! Having felt we had ‘done the Viking thing’, and trying to separate ourselves from a hundred other ‘Viking’ themed bands, we consciously brought the style of music and lyrical themes into the early medieval period, while still retaining our trademark melodies, heavy drinking songs and ‘hey-ho’s’ for it still to be recognisable as ourselves. “maledictus eris” (Cursed shalt thou be) was released in the summer of 2011 – hardly anyone noticed it wasn’t about Vikings – and we duly set about touring throughout Denmark, with a couple of stops in Germany, and an amazing couple of shows in Russia with Korpiklaani. Between October 2010 and now, a few minor line-up changes have taken place, although the song-writing core of Cris Frederiksen and James Atkin, vocalist Thor Bager, and ‘folk-guy’ Hans-Jørgen Martinus Hansen have remained constant since 2009. Each change seems to have improved our line-up musically, and brought, incredibly, ever larger beards into the Svartsot fold! 2011 saw the band play a lot of domestic shows and a few European fesitvals in support of maledictus eris, with Uffe Dons Petersen on live rhythm guitar duties. This slot was permenantly filled at the start of 2012 with the splendidly hirsuit Michael Alm (ex-Fairytale Abuse) and drumming duties were taken over by Frederik Uglebjerg after Danni Lyse Jelsgaard left following the band’s appearance at Copenhell 2012. 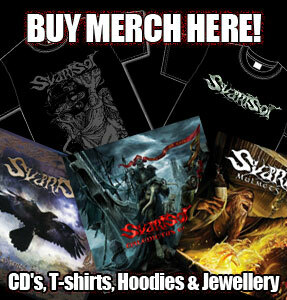 Work continued in earnest throughout the year on what would be Svartsot’s 4th full length studio album. Writing duties remained unchanged from maledictus eris and a further evolution of the band’s sound was plainly in evidence. The new album was themed around the rituals, superstitions and celebrations of a tradition Danish midsummer festival in medieval times and the band entered Lasse Lammert’s studio in late 2013/early 2014 to record ‘Vældet’ (The Well). This time around the songs were far more epic in scope and arrangement, with very few riffs repeated over the course of the album. It also featured the band’s first ever instrumental track and even some guest female vocals from Huldre’s Nanna Barslev. The album was released in February 2015 through a partnership with Nail Records and Svartsot’s own production company Of Wood and Iron Productions on a weekend which saw our most epic Danish show, in Roskilde’s Gimle, and our first visit to France at Cernunnos Paganfest at La Machine in Paris. The new songs went down very well at the shows and the year continued on a very positive note with the making of the group’s first video – for the song Midsommer at Jels Vikingby – an amazing festival in Estonia, the inclusion on the European leg of Arkona’s Pagan Rebellion tour with Metsatöll and an endorsement partnership with German luthiers Hapas Guitars. Work is of course underway on album No. 5, and we are positive that the future holds bigger and better things for Svartsot. We hope you can join us on the road for a beer and a song!